Today’s new health-system pharmacists face challenges and opportunities unknown even a few years ago, from new areas of practice to changing roles in the hospital setting. Though their supervisors and other senior level practitioners can offer valuable guidance, they cannot provide the insights, perspective, and experiential wisdom that early to mid-career practitioners can provide. 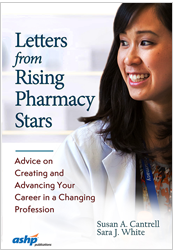 To fill this gap, ASHP has created a unique new publication: Letters from Rising Pharmacy Stars: Advice on Creating and Advancing Your Career in a Changing Profession. Edited by Susan A. Cantrell, RPh, CAE, CEO of the Academy of Managed Care Pharmacy, and Sara J. White, RPh, MS, FASHP, Former Director of Pharmacy at Stanford University and Clinics, Letters from Rising Pharmacy Stars is a collection of compelling letters from 30 “up and comers” who have demonstrated significant achievement in their careers. A companion to ASHP’s Letters to a Young Pharmacist: Sage Advice on Life and Career from Extraordinary Pharmacists, published in 2014 by the same authors, this collection forms an inspiring guide to the choices and challenges that young pharmacists are grappling with, written by practitioners who share similar generational interests and concerns. Their down-to-earth advice can help readers navigate the changes in pharmacy practice, develop a long-term career strategy, and find the right work/life balance – and also offers valuable insights to residency directors and others who mentor them.